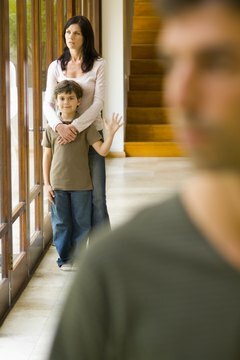 In family law cases that involve a divorcing couple with children, a motion is filed to determine who gets legal or physical custody. Legal custody grants a parent the right to make decisions for his child, and physical custody is where a child lives. Common types of custody include sole custody, joint physical custody and joint legal custody. Motions are also filed to modify existing custody due to a change in circumstance of one or both parents. A motion for sole custody, which is also referred to as full custody, requests that one parent be given physical and legal custody of a child, leaving the other parent with visitation rights. This grants the sole custodian full decision-making rights that can overrule the wishes of the non-custodial parent, who retains visitation rights, but cannot make decisions concerning the manner in which a child is raised. A parent who files this motion must demonstrate to the court that sole custody is in the best interest of the child or children. A motion for joint physical custody requests that both parents be given equal physical custody of the child. However, this motion does not necessarily mean that a child will live with both parents an equal amount of time. The motion can be filed with an agreement between parents that delineates the living arrangement, but the presiding judge has the final authority in deciding whether he will agree with the motion or apportion the living arrangement in another way. For example, a situation in which a child lives with his father only on weekends is still considered joint physical custody. A joint legal custody motion is filed when both parents want to share equally in the decision-making for their child. This motion does not determine physical custody, which is a separate issue, but is important because it grants equal power to both parents regardless of where a child resides. However, parents filing this motion should be aware that if there is a dispute about a decision, a judge will determine which parent's decision is applicable, and may favor the parent with physical custody. A motion to modify custody is a request to change the parameters of an existing custody order because of a change in circumstance. This means that something has happened that causes the existing arrangement to no longer be in the best interest of a child. For example, if a non-custodial parent is moving to another state, the existing visitation schedule may have to be changed to reflect this new circumstance. Another example occurs if a parent with physical custody commits a crime and goes to prison. The other parent can then file a motion to modify the custody order so he can be granted full custody. Quain, Sampson. "Types of Custody Motions." , https://legalbeagle.com/10028366-types-custody-motions.html. Accessed 19 April 2019. What Are the Missouri Child Custody Rights of Unmarried Parents?